A small boutique PR shop operating in Dubai since 2004. All Public Relations Agencies in Dubai – Click to Pin it! Clients: MasterCard, Bayer HealthCare, EMC, Kaspersky, Canon, Emax, FunCity, The Boston Consulting Group, Amwal AlKhaleej, Marya Investments, Kraft Foods, Ajmal Perfumes, Hewitt Associates, Mubadala, BP, GMMOS Group, and Unique Maritime Group. Office 212, Apex Atrium Building, Motor City, Dubai, UAE. Clients: Bebe, Energizer ME, RTA, Dubai Airport Freezone, London Fish & Chips, Costa Coffee, Baskin Robins, Mazda, Targus, Gargash Enterprises. “BEST” is a very elusive and hard to define word, whereas no one will agree upon and accept that definition. They say: “When in Rome, do as the Romans do.” People judge any PR agency based on its clientele. It’s hard to find a criteria more reliable (and acceptable) to judge those PR companies in Dubai. Cision.com is the favorite choice for PR companies in UAE. They buy a list and move on to updating the info and building upon it. Every year, they will rinse and repeat. Cision.com is not cheap though (I’m personally on Cision’s UAE media list and this is how I stay in touch with the PR scene in Dubai). 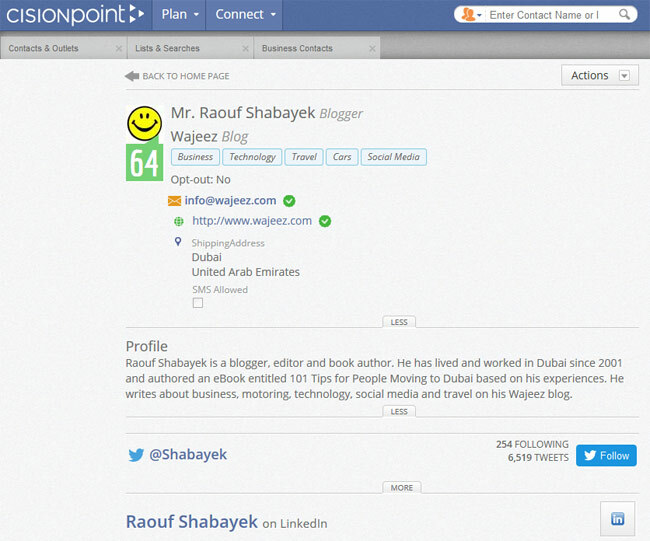 My profile on Cision Point. 64 out of 99 is not too shabby, eih? You can always try some of the free or low-cost options like: Muck Rack, Pressrush, Journalisted, Hey Press and Press Me, but there is no guarantee their lists are up to date. Just keep in mind that those sources tend to have outdated information. Take your time to research and build your own media list: LinkedIn, Twitter, Google, and mastheads. The list includes some extra email addresses, phones, mobile, faxes, top clients list, etc. You can buy my Dubai PR list from this link in the form of a PDF file. Although I have tried hard to keep this list of all public relations agencies in Dubai updated, but Dubai is known for being dynamic, changing all of the time. It’s nearly impossible to stay 100% in sync with all this action. Every effort has been exerted to keep this list updated as can be. Your feedback and help to reach that target is highly appreciated. Last update: December 2018 – courtesy of Saspromotion.com, Dubai. i need to do PR for my indian restaurant , which company do y recommend … need to target indian media . Get a quote from the small ones, like MCS/ Action, Spot On, Momentum, etc. Ask for designing / printing + distributing fliers. 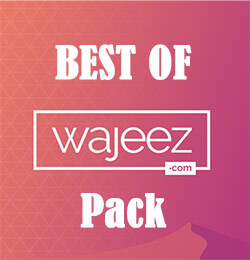 Get a special offer on Cobone / Groupon sites and the sort. If you have the budget go for Radio ads on Indian channels. Let us know how well did it go with you. 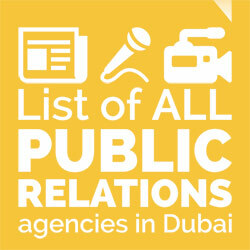 Virtue PR & Marketing Communications is a another PR agency operating in Dubai. We like Custard â€“ doesnâ€™t everyone? And, just like custard, we work well on just about anything. Established by three professionals – each with over a decade of experience in Events, Public Relations and Marketing, Custard Communications is an exciting and dynamic, young, integrated marketing communications agency. Custard Communications has the exactly the right ingredients to ensure that once you try us you are left hungry for more. So let us create the ideal mix to suit your tastes, cover your goals and satisfy your budget perfectly. Landmark PR and Events is a full-service communications consultancy covering the GCC with a regional office in Dubai, Jeddah, Riyadh, Kuwait, Oman, along with affiliates across the MENA region. Landmark Public Relations is part of the Saudi-based Al-Madar Group, we are pioneers in this field. Greetings from Electronics City in Bengaluru, India. 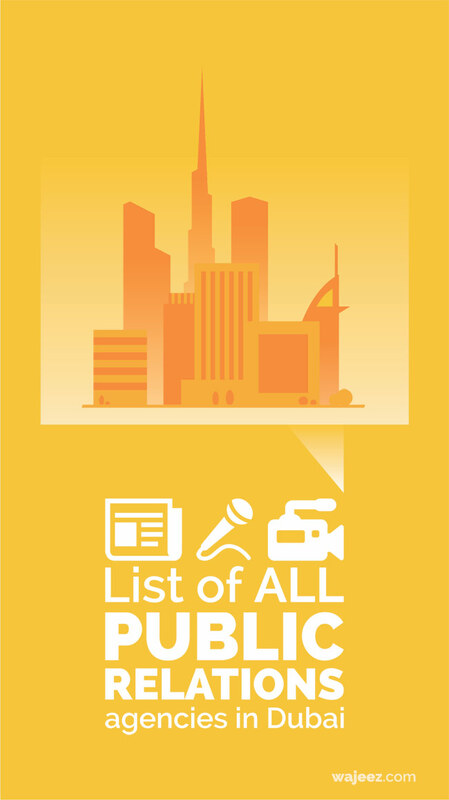 Your list is very famous in India, as many rely on it a lot in their daily PR work. Just keep updating it please.